The Japanese American National Museum will present “Memories of Five Nisei,” a free event featuring five second-generation Japanese Americans, on September 24, 2016, at 2 p.m. The speakers were among those of Japanese descent imprisoned by the United States Government during World War II and will discuss their experiences during this ordeal of mass injustice. The event is part of the museum’s Tateuchi Public Program Series. Mihara, a former executive at Boeing Company and a nationally recognized speaker on the topic of the WWII imprisonment of Japanese Americans, will show and describe revealing photos and records that highlight how the government converted the “relocation centers” into secure prisons. He was also discuss his recent research into the immigrant detention facilities in Texas and parallels there to the Japanese American experience. 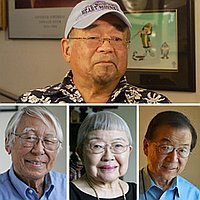 Willie Ito, an award-winning Disney animation artist and former executive at Walt Disney, will discuss the experience of seeing FBI agents search his childhood home, confiscating anything considered of possible use to espionage agents of Japan. Shig Yabu, a Boys & Girls Clubs executive, will share memories of being an adventurous boy in the camp and how he found a wild magpie bird, the basis for his best-selling books, Hello Maggie and A Boy from Heart Mountain. Dr. Takashi Hoshizaki was of military draft age in camp when the government decided to call on young Nisei to join the armed forces and fight for the United States. Hoshizaki believed the draft of Nisei in camps was illegal, given the denial of basic civil rights to imprisoned Japanese Americans. He will describe the outcome of his federal trial and time he spent in a federal prison. The fifth speaker, Toshi Ito, will describe life during and after camp, including how she met her future husband, James Ito, the head of farm operations at Heart Mountain. Toshi Ito was featured in The Legacy of Heart Mountain, an award-winning documentary about the World War II imprisonment by David Ono and Jeff McIntyre. In the documentary, a portion of which will be screened at the JANM event, Ito describes what happened to her father when he could not return to his former job after the war. “Memories of Five Nisei” will talk place in JANM’s Tateuchi Democracy Forum. Admission is free, but reservations are recommended. To reserve space visit janm.org/events/tateuchi. Tatau: Marks of Polynesia explores Samoan tattoo practice through photographs that showcase the work of traditional tatau masters alongside more contemporary manifestations of the art form. Curated by author and master tattoo artist Takahiro “Ryudaibori” Kitamura with photography by John Agcaoili, Tatau highlights the beauty of the Samoan tattoo tradition as well as its key role in the preservation and propagation of Samoan culture.